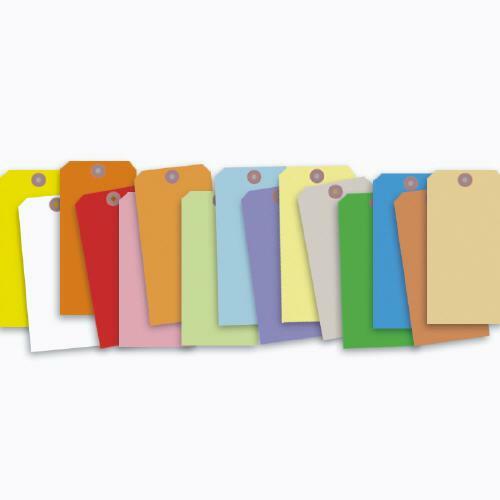 Colored Tags With Wire Or String 3 1/4 X 1 5/8"
Colored Tags With Wire Or String 4 1/4 X 2 1/8"
Colored Tags With Wire Or String 5 1/4 X 2 7/8"
Colored Tags With Wire Or String 6 1/4 X 3 1/8"
Staying organized it a vital aspect of every business, no matter the industry. The organization procedures of your organization, or lack thereof, can potentially have a dramatic effect on the success of your daily operations. One of the best ways to stay organized is to label everything with custom printed color tags. Labeling with custom printed color tags is a great way to attach information to a specific item, making it easy to keep track of items or effectively communicate with other members of your organization. If an item is labeled, employees can know the information about that specific item, without having to search or ask for it. We have witnessed the usefulness of custom printed tags, across a wide array of industries. From labeling items in warehouses and stockrooms to labeling items in repairs shops or automotive establishments. It is vital that you use quality custom printed tags. Tags made of a low-quality material or printed at a low standard can become damaged, resulting in the information no longer visible. DesignsNprint uses only the highest quality materials and printing techniques, making sure you have custom printed tags that will increase productivity and reduce mistakes.